We've have been making Invader wheels on and off since 1975 and only use state of the art sealed ball bearings, not the older more maintenance dependant roller type bearings, like other imitators. Chromed Steel Wheels are the ultimate in style strength and durability. Our triple plated chrome creates a superior bond, unlike aluminum wheels, that will last for years. 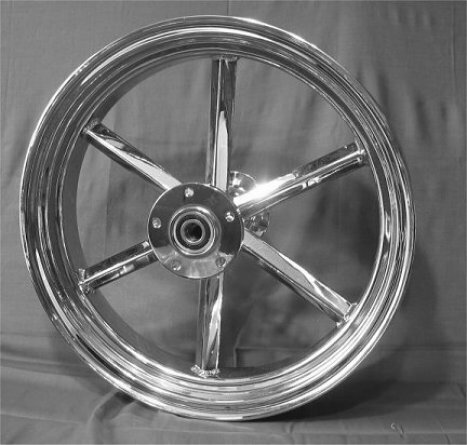 All Steel Wheels are Computer Aided Designed (CAD) and precision machined in the U.S.A. by American Craftsmen with the highest quality specifications available. The wheels are hand assembled and TIG or MIG welded that enable the wheels to run true at or better than factory specifications. All our wheels are made to run with or without inner tubes. Should you decide to run a tube, make sure you install a tire that is made for tubes. Do not run a tubeless tire with an inner tube or run a tube type tire without a tube. Check with your tire manufacturer to make sure you have the correct configuration before installing tires on any wheel. Steel Wheels are stronger than billet aluminum and this strength allows the steel material to be thinner creating a wheel approximately the same weight or less than billet aluminum. All our wheels are unconditionally guaranteed for one full year against any material, workmanship, or chrome defect, depending on your georaphical location. If you do not take care of any wheel, the chrome will deteriorate rapidly, especially in ocean areas and where salt remains on the road in winter months. adds superior torsional strength for bikes with high torque motors, rough roads, and required for rigid frames. BEWARE OF IMIATATORS AND OTHERS CLAIMING TO HAVE "RE-INTRODUCED" INVADER WHEELS. Requires Larger Expander Hub for Rear wheels. Some customers have called it a work of art, and invoked a visualization of DaVinci's Vitruvian Man.